Today, I went to Soup Sunday with Flyer food writer Pam Denney and her husband Tony. The fund-raiser for Youth Villages always draws a crowd. Americans aren’t the only folks known for fusing foods from different cultures. Some Indian restaurants, including Woodlands Indian Cuisine on Hacks Cross, offer an Indo-Chinese menu melding — you guessed it — Indian and Chinese. Woodlands’ Gobi Manchurian combines cauliflower (arguably the star vegetable in Indian cooking) and a spicy-sweet soy-based sauce (the Chinese part) for delectable cauliflower fritters. Florets of cauliflower are virtually unrecognizable when deep-fried and covered in a bright-red sauce. In fact, when I first tried the Gobi Manchurian on Woodlands’ Saturday buffet, I was certain someone had slipped a meatball onto my plate. The savory fritters may be ordered wet (with extra sauce) or dry (no sauce). A couple of days ago, slashfood.com posted a story about Maurice's Gourmet Barbeque, a chain in South Carolina. The gist: Maurice's began flying the Confederate battle flag some years ago after the flag was taken down from the South Carolina capital dome. But, now tough economic times have forced Maurice's to take down most of its flags. The explanation? It's not that they're trying to draw back offended customers but to save money on dry-cleaning. Pop quiz, hot shot. It’s Soup Sunday. You’ve got more than 25 soups (not to mention desserts, breads, and other treats) to taste between 11 a.m. and 2 p.m., while working through a crowd of 2,000-plus at the FedExForum. Hungry Memphis asked Half Shell owner Danny Sumrall for some Soup Sunday strategy. He should know a thing or two, as he helped found the event 21 years ago. 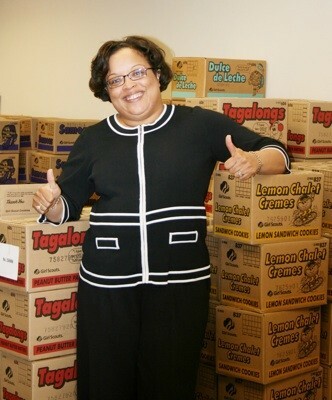 Angela Woods started as CEO of Girl Scouts Heart of the South on January 15th — just in time for cookie season. She took the time to answer a few questions for Hungry Memphis. I'm picturing you in your office right now surrounded by hundreds and hundreds of boxes of cookies. Please confirm. Girl Scout Cookies are back! They were delivered this morning and our office does look like a cookie warehouse. Girl Scout Troops are busy picking up cookies for those who pre-ordered their cookies in January. This week's "Recommended Dish" by Bianca Phillips called for some last-minute editing. In singing the praises of Woodlands' Gobi Manchurian, a cauliflower fritter, she wrote, "I was certain someone had slipped a meatball on my plate. Thankfully, Woodlands is meat-free, so I knew that wasn’t possible." That last line was excised because Woodlands started serving meat on February 12th. For the past year or two, I’ve been telling anyone who will listen: Casseroles are ready for a comeback. After stopping by the cookbook sale at Second Editions in the Benjamin L. Hooks Central Library Tuesday evening, I’m either right (lots of casserole cookbooks) or wrong (lots of casserole cookbooks). On March 25th and 26th, the grounds of the Ducks Unlimited headquarters will be the site of the Pigs in Flight Barbecue Competition and Festival. Johnson says that while Ducks Unlimited already has a structure in place for holding events, the barbecue contest presented new challenges. This is why they reached out to the Memphis Barbecue Network (MBN). A trio of links today all about hot dogs. Stacey Greenberg, a frequent contributor to the Flyer's food section, sent me this link from The Riverfront Times food blog Gutcheck titled "20 Unholy Recipes: Dishes So Awful We Had to Make Them." Writer Robin Wheeler cooks up alarming recipes from old cookbooks. Pictured above is Jellied Bouillon with Frankfurters. Spotted this drink-specials card at lunch today at the Blue Monkey downtown. WTH?, I thought. Turns out, Caucasian is also known as a White Russian. And ... the Dude of The Big Lebowski uses the two names interchangeably. But when I saw the recent header Deep-Dish Rutabaga-Fennel Gratin, I thought back to a New Year's Hungry Memphis post about things I had never done. In this case: cook something with rutabaga. Back in December, the Flyer ran a feature about Petra relocating down the street, and Fuel moving into the site at 1761 Madison. Fuel opened for business about a week ago, and today we stopped by to check it out. After my last rant, co-worker Bianca swore she'd be bringing in a tasty king cake on Fat Tuesday. Yesterday, I happened to be at Whole Foods during their "Kiss the Fish" promotion, a Valentine's Day special for which shoppers toss aside their dignity for a bargain on lobster tails. The Cooper-Young neighborhood was dealt a one-two punch recently when Dish closed, followed by the Blue Fish soon after. But don’t count 'em out yet. The Blue Fish is being re-opened today as the Reef, and coming soon are the Grace breakfast and lunch spin-off Au Fond and the low country restaurant Sweet Grass.